Home - Turn on your entertainment system with two powerful words, “Xbox On,” and a custom-tailored Home dashboard welcomes you with your favorite games, TV and entertainment. Snap - Do two things at once on the biggest screen in your home. Use Snap to jump into a multiplayer battle while watching your favorite movie, talk with friends on Skype while watching live TV, or track your fantasy team on TV as you watch the big game and more. Skype for Xbox One - Specially designed for Xbox One, talk with friends on your TV in stunning HD, or for the first time ever, hold group Skype calls on your TV. 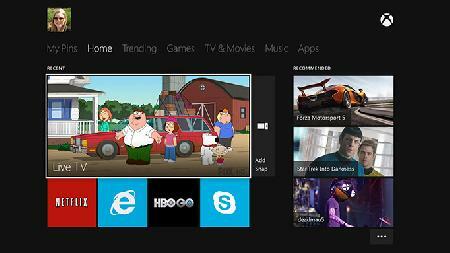 Trending - Stay on top of what is hot on TV by discovering the entertainment that is popular among your friends, and see what is trending within the Xbox community. OneGuide - Find your favorite entertainment easily, searching by network, name or time, all with the sound of your voice and presented in a tailored program guide. “Forza Motorsport 5” from Turn 10 Studios is the latest edition of the highest-rated racing franchise of the past 10 years.3 Built from the ground up to take advantage of Xbox One and the infinite power of the cloud, no game better delivers the sensation of being behind the wheel. “Forza Motorsport 5” sets a new bar for racing games and will be available exclusively for Xbox One at launch. “Call of Duty: Ghosts” is the next generation of “Call of Duty” and a stunning leap forward for the franchise. 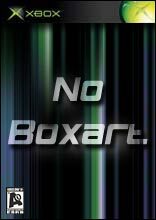 It delivers an all-new world, an all-new cast of characters and an all-new story, built on a new, next-generation engine. The next-generation technical innovations built to support the incredible gameplay advancements make this the most beautiful and immersive “Call of Duty” experience yet. Activision and Microsoft also announced the renewal of their close partnership that will see both the return of the “Call of Duty® Championship,” presented by Xbox, as well as all-new downloadable content debuting first and exclusively on the Xbox platform. “FIFA 14,” “Madden NFL 25,” “NBA LIVE 14,” and “EA SPORTS UFC” from EA SPORTS will change the way consumers experience and play sports games. Driven by the new EA SPORTS Ignite engine, these new EA SPORTS games will deliver massive innovations in human intelligence, true player motion and living worlds. Adding to its commitment to Xbox One, EA SPORTS also announced the promise of exclusive content to be revealed in the coming months. “Quantum Break” from Remedy Entertainment is a revolutionary entertainment experience from the creators of “Max Payne” and “Alan Wake” that blurs the line between gaming and TV by integrating drama and gameplay into one seamless, uniquely immersive experience. How you play the game impacts the show, and the show informs how you play the game. “Halo” television series - Award-winning filmmaker, director and producer, Steven Spielberg will executive-produce an original “Halo” live-action television series with exclusive interactive Xbox One content, created in partnership with 343 Industries and Xbox Entertainment Studios. National Football League (NFL) - A multiyear, landmark partnership will deliver the ultimate interactive NFL television experiences for the next-generation Xbox One and leverage Microsoft devices and services to evolve both in-game and on the sideline. The NFL on Xbox will redefine broadcast experiences through innovations around Skype, Xbox SmartGlass and player-worn technology; add an all-new fantasy football solution for the biggest screen in the house; and create a personalized NFL destination only available on Xbox One. Xbox One is built to amplify an all-new generation of Xbox Live that is more powerful, more personal and more intelligent. Unleashing the virtually unlimited power of the cloud makes everything more convenient and accessible, from allowing games to be installed in segments so that gameplay can start quickly to updates downloading in the background. Save and store your personalized profile, games and entertainment in the cloud to access them anytime, from any Xbox One console.4 In addition, existing Xbox Live Gold Membership for Xbox 360 will seamlessly carry over to Xbox One.5 Xbox Live takes you deeper into the games you love with all-new features. Smart Match - A new Smart Match matchmaking system virtually eliminates waiting in lobbies by estimating wait times and finding people you want to play with while you are enjoying other activities — reputation fundamentally matters and helps find best matches. Game DVR - A dedicated Game DVR captures and accesses your magic moments, all saved to the cloud. 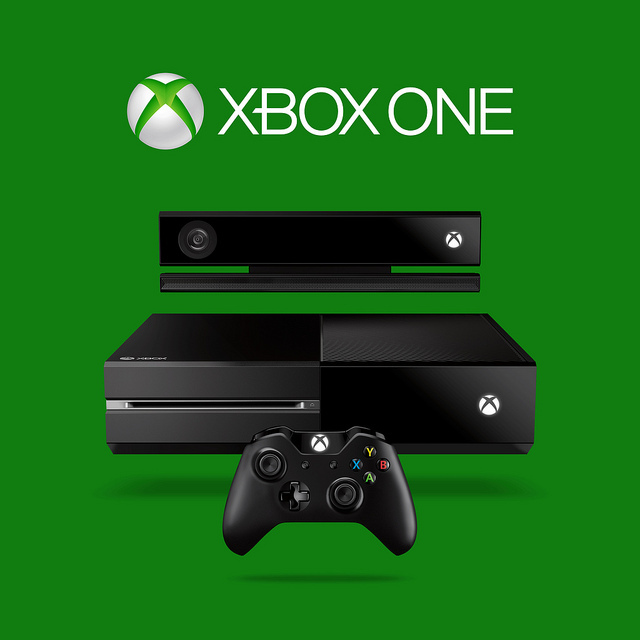 Along with sharing tools, you will have the most amazing bragging rights with Xbox Live. Living Games - Dynamic, living worlds evolve and improve the more you play, and advanced artificial intelligence can learn to play like you, so friends can play against your shadow. Expanded achievements - A new and expanded achievements system captures video of your epic moments, continues to grow a game’s achievements over time and rewards you in new ways, and your Gamerscore carries over from Xbox 360. Xbox SmartGlass - Xbox SmartGlass is natively part of the Xbox One platform, built in from the beginning with the ability to quickly render content directly onto your device, and now more devices can connect at one time for multiplayer and shared entertainment. 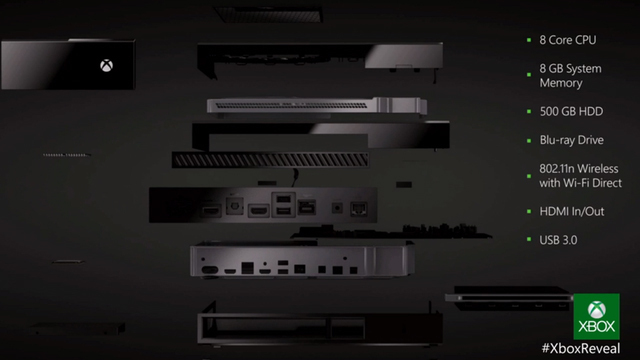 Check out the "What we know so far about 'Xbox One'" thread in our forums here for more detailed info and discussions. Will you be snapping up the next-gen Xbox One when it launches? Get involved in our official forum discussion here to let us know, and subscribe via Twitter, Facebook, Google+ and YouTube for more news as it arrives. After a tragic event that nearly ends their species, few among the Elves can recall a time, long ago, when they once prospered and knew greatness... Hunted relentlessly on the surface of Lareleth by t..